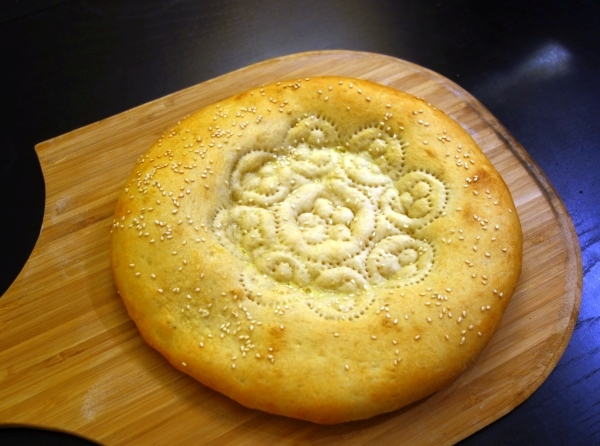 My version of Uzbek nan bread. 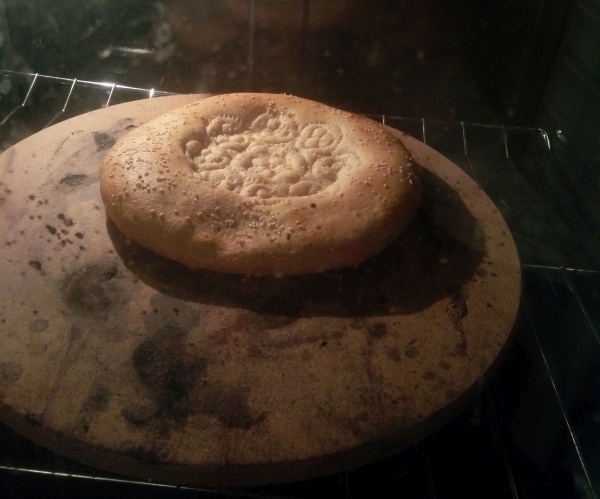 This recipe is for the Uzbek bread, obi non, or in Russian “lepyoshka“, but you will see various breads that look very similar to this all over Central Asia – round, and pressed down in the middle, almost like a giant bagel or pizza crust. In Central Asia, bread is such a basic staple food that you get it with literally every meal, without asking for it. If you visit someone’s house, they will bring you bread and tea. 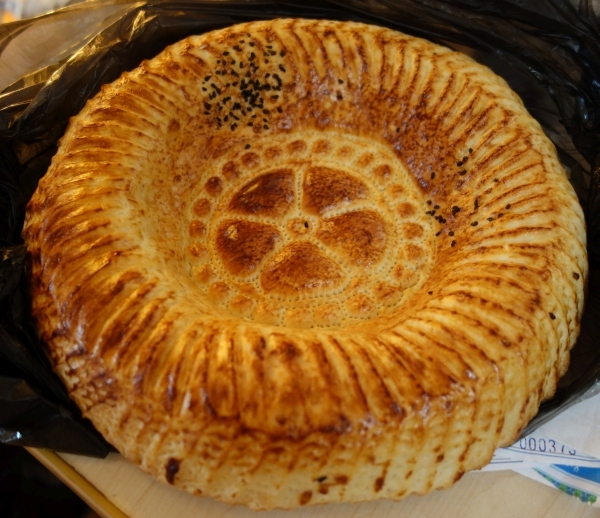 Beautiful bread bought at the Siyob bazaar in Samarkand. This is a versatile bread and tastes great just eaten by itself, fresh out of the oven. It’s also great to eat with soups and stews, or with jam. It’s most similar to a baguette in taste and texture. 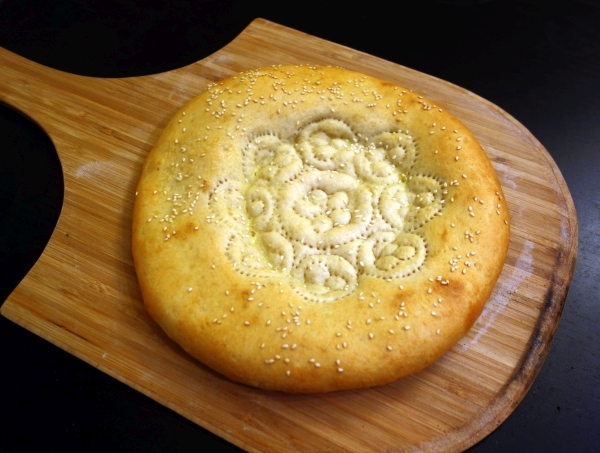 This bread is pretty similar to the Uyghur version I wrote about earlier. The difference is that it is much thicker and the pressed down part in the middle is smaller. 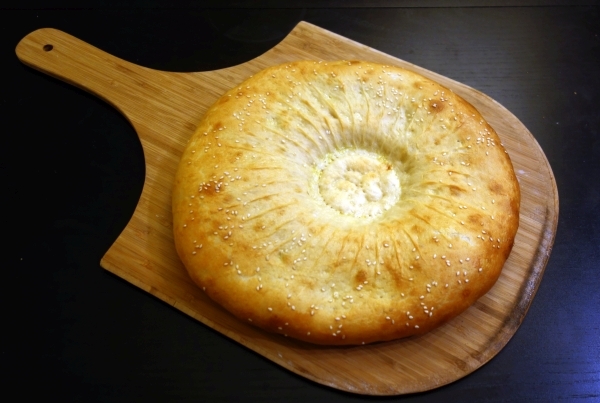 If the Uyghur nan bread is like a big pizza crust without any sauce on it, the Uzbek nan bread is like a giant inflated bagel. 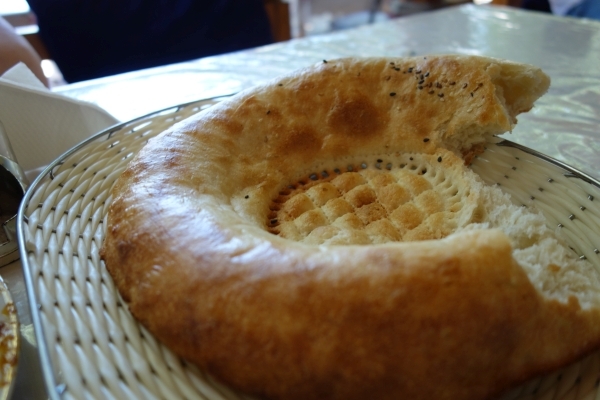 Bread served at a restaurant in Bukhara. Making bread is truly an art – don’t be surprised if it doesn’t turn out right the first few times you make it. I had to make this bread 20+ times before it turned out the way I like it, and I’m still trying to perfect my technique. 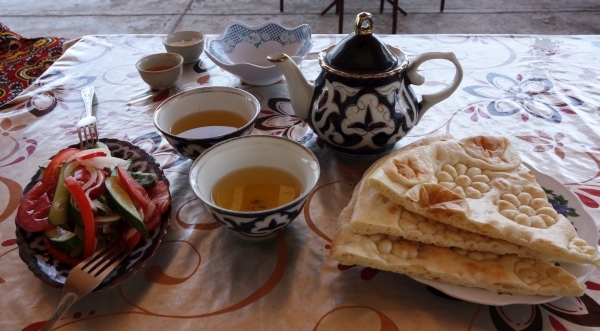 Bread, tea, and salad at a Khiva restaurant. 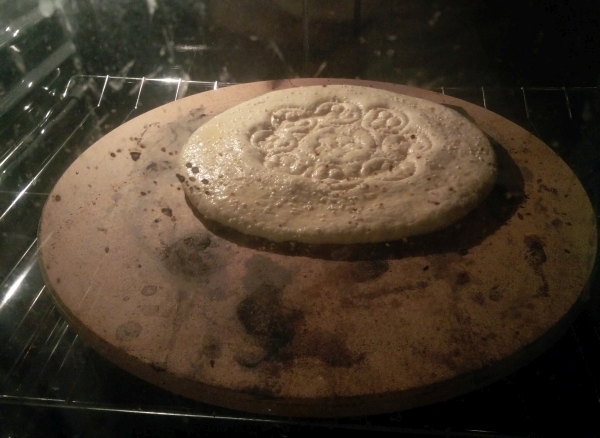 In Central Asia this bread is made in an oven called “tandyr”(similar concept to a tandoor oven), slapping the dough directly onto the oven walls, as you can see in the video below. I obviously can’t replicate that at home, but I’ve gotten good results with a pizza stone. Failing that, it would probably turn out OK on a baking pan. 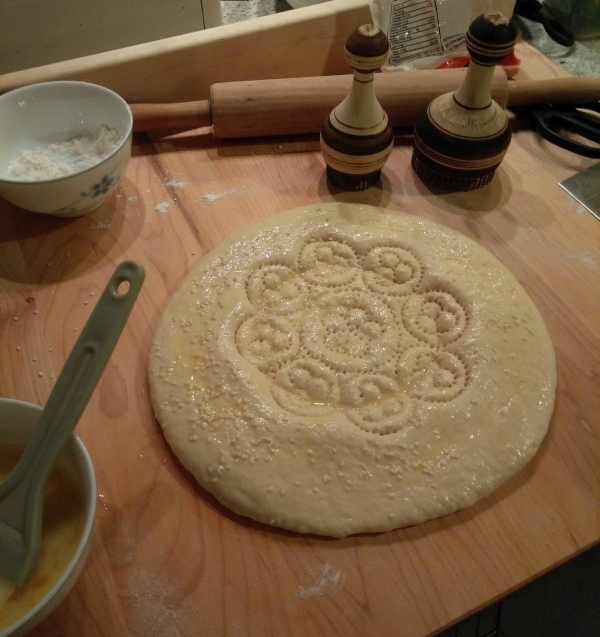 I use some bread stamps I bought in Uzbekistan to make the patterns on the bread. They are called “chekich”; you can see the bakers in that video stamping the dough with them in the beginning. You can buy them from this store on Etsy, or if you know someone traveling to Central Asia, ask them to buy a couple for you – they only cost a few dollars and should be sold in almost any bazaar. In New York, you can buy bread stamps at Fortuna grocery in Brooklyn – they sell small wooden ones behind the checkout counter, along with plates and teapots. If you don’t have a chekich, you can just use a fork. Milk – optional, use instead of water to make the bread more soft. I like using a mix of milk and warm water. Make a pile of flour with an indentation in the middle. Don’t worry about how much or how little flour to put; you will either end up with a bigger or smaller bread and after a few tries you will know roughly how much flour makes how big a bread. In the middle, pour some warm water. 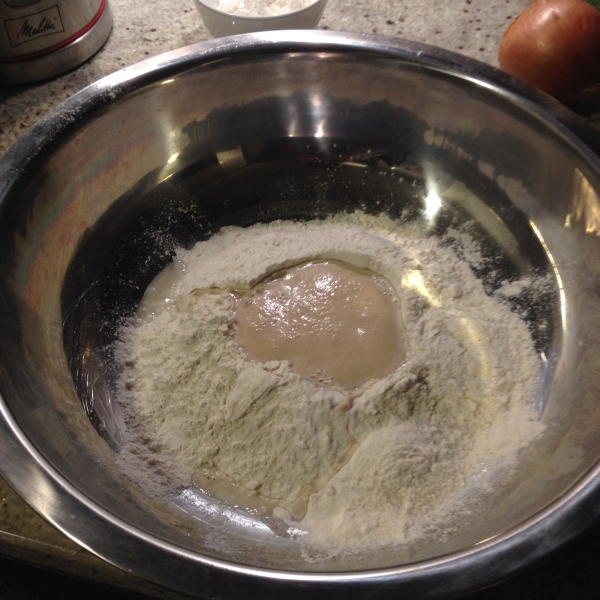 Put in half a packet of dry yeast, a teaspoon of sugar, a teaspoon of salt, and a pinch of flour. Then stir up the middle and wait for a few minutes until it bubbles up and turns into a foam. Begin mixing the water into the flour. Mix until everything is dry and slowly add more water until you have a semi-solid dough, scraping the excess flour off the walls of the bowl. Don’t worry about exactly how much water to put; if you put too much water then put in more flour until it’s solid. I generally err on the side of too little water, because the dough will end up getting very sticky once you start kneading it. You can always add more water. When it is solid enough to work with your hands, flour a clean surface and start kneading the dough, adding more flour as required if it gets sticky. Knead this for 10 minutes until it no longer sticks to your hands and is relatively firm and pliable. Put this in a bowl and let it rest for 40 minutes in a warm place, covered with a clean cloth. After the 40 minutes are up, the dough should have risen (but don’t worry if it appears not to have risen that much). Take out the dough and knead it again for a few minutes, then shape it into a fat disc and let it rest for another 15 minutes, covered. Why do we rest the dough so much? So that we can form it into a big doughnut later. If we don’t rest it enough, we’ll find the dough is resistant to shaping. 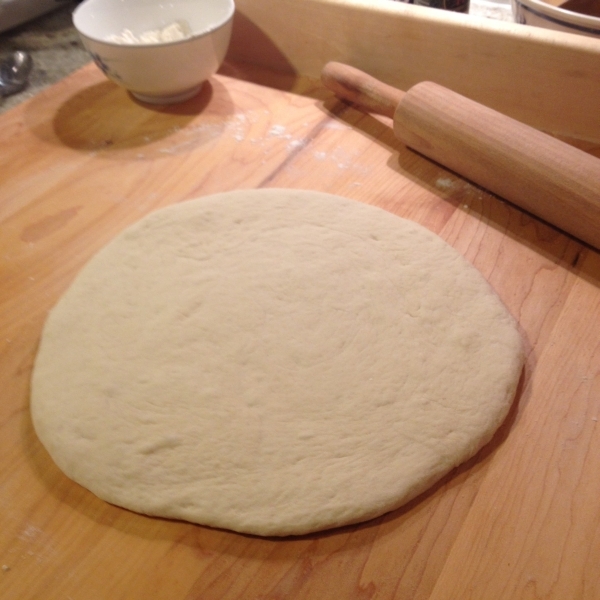 After the 15 minutes are up, take the dough and roll it out into a big circle, not too thin. 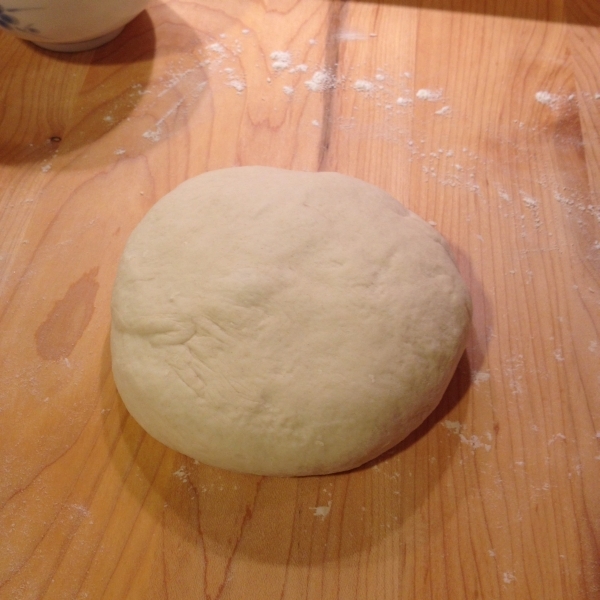 Then use your fingers to press down the middle of the dough, pushing the air outwards. Don’t make the middle too thin. 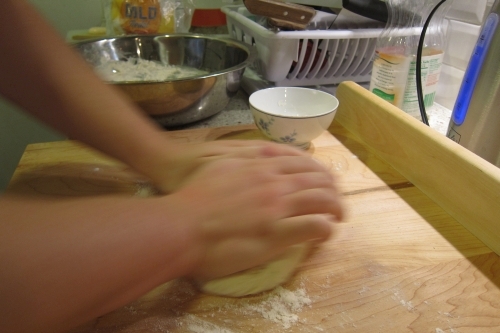 Use your fingertips to press a circular ring into the middle of the dough. You really want to define a nice circular edge, it’s not so important to press the middle down. Let this rest for another 5 minutes. Press all the way around your circular indent again. 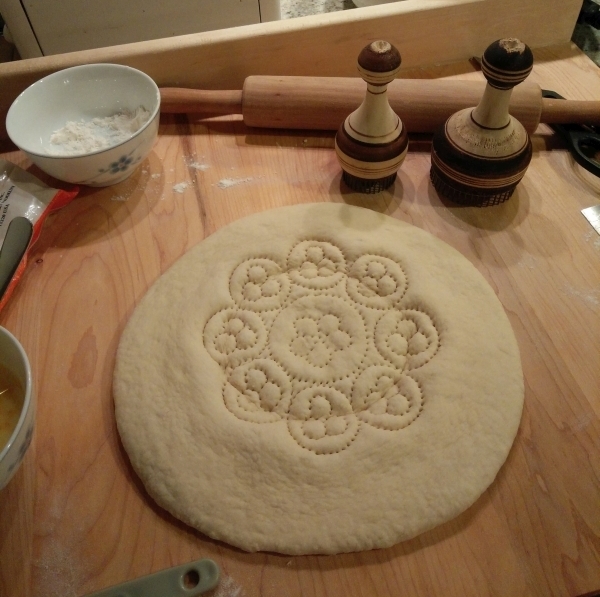 Now use a bread stamp to press down the middle and make nice patterns. The patterns aren’t just to be pretty, the holes help prevent the middle from rising, giving us that nice giant doughnut shape we want. If you don’t have a stamp, you can just use a fork to make holes all around the center. 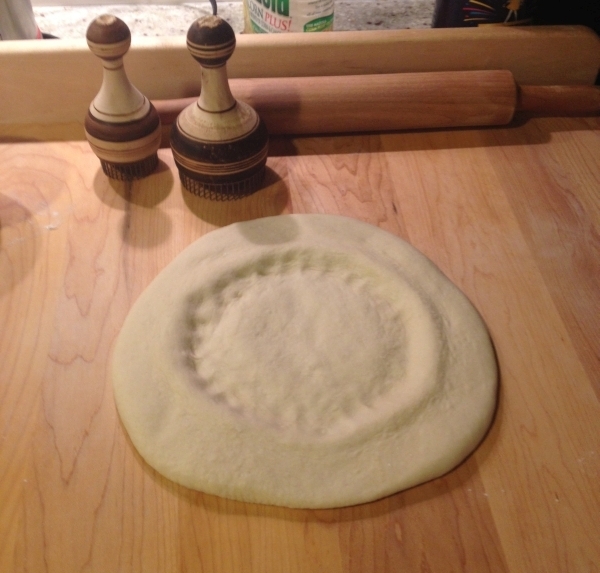 Whether you use a stamp or fork, make sure to press down hard so the holes go all the way through the dough. Use a brush to cover the bread with a mixture of beaten egg and milk. This will give the bread a nice shiny golden brown crust when it’s done, and also make it sticky so our toppings won’t fall off. If you don’t have egg, you can use just milk to glaze the bread, or failing that, water. The point is to wet the bread – the choice of egg or milk or water just has different effects on the finished appearance. Whatever you do, just glazing the top and sides is fine – don’t glaze the very bottom because it can end up getting stuck to the peel. Then add your toppings – I usually just put sesame seed, but nigella seed works nicely too, as does finely minced onion or garlic. Imagine it’s a giant bagel, just add whatever you would like on a bagel. Rub flour into your baking peel to create a rough surface. Now you need to be fast so the dough does not stick to the peel. Put your dough onto the baking peel. Then quickly slide the dough onto the baking stone in an oven preheated to 400F. You just put the tip of the peel on the far end of the stone and wiggle it back and forth until your dough slides off – that’s why it’s crucial to flour the peel first, otherwise the dough might stick. If your dough ends up sticking to the peel and won’t come off, it’s no big deal, just take the dough with your hands and put it onto the stone (be careful not to burn yourself). Bake this for about 15 minutes until the bread has a nice golden brown crust. Enjoy! I just got a bread stamp like the one shown. Do I wash it before using? How do I take care of it?